Fine art must be the most difficult thing to sell online. It is so easy to make a painting look better on the screen than it does in reality. At The Best Things, we strive not to make the painting look better than it does, but to describe is so critically, that you will be pleasantly surprised when you receive it. If we have a painting that does not meet this criteria, you won't find it listed here. We offer an unconditional money back guarantee, so frankly, we had better do a good job or we will just end up getting the picture back. We specialize in Victorian oil paintings and fine marine art, but we appreciate all good art. Victorian artists had a prodigious output, much of it of very high quality. Consequently, it is still quite affordable although it is appreciating quickly. It is our opinion that you won't find a better art investment today than quality 19th Century paintings. As with all antiques, condition is very important. Just as with wooden items, an overcleaned painting is a problem. We are of the school of thought that less is more when it comes to antique conservation. For example, we will not authorize relining a canvas unless it absolutely has to be done. Our conservator is fanatical about preserving the original artists work and will never do more inpainting than is absolutely necessary to replace missing paint. We are lucky to have this association as he is also in demand from some of the nations most respected museums. We will strive in these listings to mention everything. Most galleries just describe pictures as clean and ready to hang. We would not buy a painting based on such a vague condition report. Why should you? This is a ship's portrait of a four masted barque built of steel and wears the pre-1914 German flag. Purvis was an artist of choice for these portraits among the affluent Europeans of his time, and pictures of yachts from various European countries have appeared. Examples of his work hang in the National Museum of Wales (he worked in Cardiff) and the National Maritime Museum in Greenwich. This picture has great lighting and color. It clearly demonstrates that Purvis was far more than your average ship portrait painter. If he had been an American artist, his work would probably be selling for 100 times as much. I really like this picture a lot. I like all of our paintings, but I love this one. The frame is old and may be original. It has some minor damage but is still quite useable as is. The canvas measures 18" by 12". We have had it cleaned and varnished and it looks wonderful. Some minor inpainting was necessary, as is normally the case. Oil on Canvas. Very Good Condition. This picture is of a Swedish frigate in rough seas. The picture is signed and dated '89. This is another one of my favorite pictures but what really sets this one apart is the quality of the sea, which looks as real as any marine picture that I have seen. The ship is under partial sail because of the weather, and the sky is also very realistically portaying stormy weather. The frame is not as old as the picture, but is an attractive frame in good condition. This picture currently has the most prominent spot in our house, and we hope it will have a similar spot in your house. The canvas measures 29" by 46". The condition is wonderful, as good as it gets in old pictures, and we have not had it cleaned. This picture is of an English Frigate at sea with storm clouds gathering in the disance. Carl Oscar Carlson does not seem to have been a very prolific artist and there are not many examples of his work about. However, he was far more accomplished than his limited body of work would suggest and this is quite a well executed picture and very pleasing to the eye. This picture is much more alive and vibrant than your typical ship portrait. This is one painting that I will really be sad to see go. This picture is nicely framed in simple but nice modern frame. The canvas measures 27" by 17". The condition is wonderful and we have not had it cleaned. Oil on Canvas. Fine Original Condition. This picture seems to be painted in the transitional period in Snell's career, when he was changing his styles from a more traditional 19th Century English style to a more French impressionist influenced style. 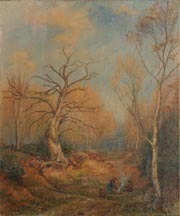 It is a woodland scene of a gypsy encampment, and is titled on the back "Gypsies in the Old Gravel Pit". It is signed on the front and back. The photo has too much glare from the varnish which is obscuring the detail. It is a much better picture than this photo implies. I will try and redo the photo. The canvas measures 20" by 24". The frame is a 1960s or 70s replacement in the Victorian style, in nice condition. The picture is freshly cleaned and has no restoration. This picture is of horse drawn wagon going across the shore to meet a fishing boat. It is clearly signed G. Hayes but this name is too common to definitively identify the artist. It is probably British but it has been suggested to me that it is Irish. The sky is masterfully done and the overall picture works very well for me. It is priced cheap because of the ambiguity of the artist. This is really a nice picture. It is not framed. The canvas measures 24 1/2" by 17 1/2". The condition is nice and we have not had it cleaned. It is ready to frame and hang. Oil on Canvas stretched over board. Excellent Original Condition. The Victorians loved the Dutch masters and marvellously well executed copies of 17th Century masterpieces were made in the 19th Century. This picture is probably not a copy of an earlier picture, instead it is an original picture but in the style of the17th Century and when it was new would certainly have been displayed as if it was an earlier picture. 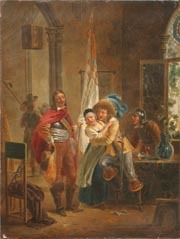 There is an old label on the stretcher, now all but illegible, that is copied in a later, but still old label on the canvas, which reads, "Oil Painting: Very Fine Early 18th Century Dutch Painting, "Interieur de Corps de Garde Hollandaise" by Francis Danks, Noted Dutch Painter, 1650 - 1703. Monogrammed." It is my opinion that this label is spurious but you can draw your own conclusions. Either way it is a superbly well executed picture in the classic Dutch style. The canvas is original with one small patch on the back where the canvas was slightly torn. This repair was done by our conservator, to the best modern standards. The surface has light crackelure throughout. It has been recently cleaned and varnished. The canvas measures 9 1/2" by 13 1/2". The frame is a modern gold plated plastic frame that is not worthy of this picture and should be upgraded. Remember, we are Larson-Juhl dealers and offer substantial discounts on new frames with the purchase of a picture. Oil on Canvas. Very Good Original Condition. This is a classic shore scene in the style of T.B. Hardy, who Mortimer is said to have emulated. Thomas Mortimer is referenced in three of my reference books, and yet very little seems to be known of him. His dates are just listed as 19th Century and no location is given. All that is said is that he liked to emulate T.B. Hardy. This is surprising, considering what an accomplished artist Thomas Mortimer seems to have been. This is a particulary appealing picture with a well executed fishing boat in the foreground and a village church off to the right side. The picture is in wonderful condition and the colors are bright and vibrant. The glass in the frame broke in shipping (no damage to the picture) and we have left it without glass in case you want to reframe it. The current frame is from Boots framing shop and has a wonderful label on the rear to prove it. I am not sure what years Boots was in the framing business but this could well be an original label. The frame has some damage, as all old gesso frames seem to, but the gilding is still bright and it looks quite presentable as it is. We would leave it in this frame. This picture is large for this artist, and the picture alone measures 20" by 9 1/2". There is a large matt around the picture so the frame is quite a bit larger. Click to see a photo with the frame. Watercolor on Board. Fine Original Condition. This is a classic Parisian street scene. These picture are so popular that it is not always clear how old the picture is. My restorer and I studied this picture very carefully and we both feel comfortable in saying that it is period. It came out of an estate where it had been for at least 30 years. The artist appears to be Eduard Lambert, however there are so many artists names Lambert with the first initial E. that it is hard to be certain. The only dates give for Eduard Lambert are that he worked in the 20th Century. What is certain is that this is a first quality oil painting that belongs in a good home. With the big name artists all bringing astronomical prices, this is a chance to get a nice example at an affordable price. The frame appears to be the original and is a typical 20th Century copy of a 19th Century style gesso frame. The frame has no damage but there are numerous cracks in the gesso and abrasions to the gold. The frame looks appropriate to the picture. This picture does not appear to have ever been cleaned and it would brighten up slightly with cleaning but it really does not need it and this type of picture probably looks better as it is. This picture measures 20" by 28" excluding the frame. Click to see a photo with the frame. This is a North African scene, probably Morrocan. I have not been able to find any information on the artist but the painting is well excecuted and he was clearly a professional. The picture appears to be late 19th or early 20th Century. The condition is perfect with bright colors and what is probably the original frame. There is some gesso loss to the frame but it would be fine to hang it as is. The picture alone measures 21" by 16". Priced cheap for its quality since I can't pin down the artist. The photos are lousy because of reflections on the glass.Click to see a photo with the frame. This picture is signed with a strong signature, but it is so stylized that I can't decipher it. My best guess is James Mark... It is a very well done painting of haymaking and could be a real steal depending on who the artist turns out to be. This is a very detailed and well exectued picture. Measures 14" by 20" not counting the frame. It is in a relatively modern frame and looks quite presentable as is. If you look closely there is some dirt on the picture but it does not detract and I would leave it alone. It is after all an antique. It could be cleaned. Watercolor. G+ (would clean to Fine) Original Condition. This is a medieval street scene with a gothic cathedral in the background. This is not a highly detailed painting but the colors are wonderful and it is one of my personal favorites. It is unfortunate that the signature is indiscernable as this is the work of an accomplished artist. It appears to be in the original frame and on the back is a great label for a Leeds frame shop. The actual picture measures 11" by 15." The frame has significant losses and could use some attention. Watercolor . Fine Original Condition. This picture is titled on the back, a "Banquet of Boats", and that is exaclty what it is. It is simply painted and yet very powerful. The frame is a simple frame that neither enhances or detracts from the frame. The matting in the frame is stained. You will probably want to get it reframed with a more elegant frame. There are a couple of small spots of foxing on the picture that could easily be removed but they are not obtrusive and we chose to leave it as found. This picture is a virgin find from an estate sale. It is not faded and would rate fine condition otherwise. The picture itself measures 9 1/2" by 13 1/2". This is a scene of a steamer heading up river at dusk. Billing was an accomplished Swedish Painter and this picture really conveys the feeling of evening coming on. The canvas measures 9 1/2" x 12 1/2." It is in a good gold frame that could be original. Oil on Canvas. Cleaned and ready to display. This is a shoreline scene at dusk with a few sailboats visible in the distance. This is a good painting that is very typical of Billing's work. The canvas measures 7 1/4" x 10." It is in a good gold frame that could be original. Oil on Panel. Cleaned and ready to display.